If you are a Halo fan, then this contest is definitely for you. The Halo Legends Contest was launched recently in support of the upcoming DVD release of Halo Legends - the acutal release date is February 16th. By entering the contest, you'll have the opportunity to win a Behind-the-Scenes Trip to Microsoft’s 343 Industries, Xbox 360 Elite & Blu-rays/DVDs of Halo Legends. Halo fans can dip even further into the mythology of the upcoming episodic Halo Legends film release by participating in the Halo Legends Heroes Journey Sweepstakes. 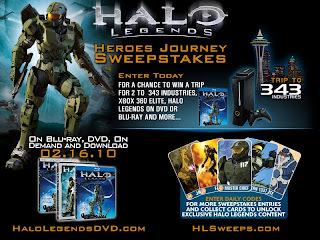 Starting January 28, 2010, fans are invited to make an active search for special codes on the film’s social networking pages, and entrants will be eligible to win the coveted grand prize – an exclusive, behind-the-scenes trip to Microsoft’s 343 Industries, the production company behind Halo Legends. Other prizes include the Xbox 360 Elite, as well as Blu-rays and DVDs of the film, which will be released by Warner Home Video on February 16, 2010. Fans can enter the sweepstakes through http://HLSweeps.com. The sweepstakes centers around a virtual trading card game hosted as a Facebook application. Collecting up to four distinct codes each day provides access to Halo Legends virtual trading cards and additional sweepstakes entries. The cards are organized into sets which, upon completion, grant to exclusive content (video clips, still images, information) from the Halo Legends movie. In addition, each card expands in size and provides additional details about its place in the episodic film. Daily codes are available on http://HaloLegendsDVD.com, http://facebook.com/HaloLegendsDVD, http://myspace.com/HaloLegendsDVD and http://twitter.com/HaloLegendsDVD. Each unique code equates to two additional cards and one sweepstakes entry. Fans can invite their Facebook friends to their Heroes Journey Squad to trade virtual cards and help complete collector sets – in order to more quickly unlock the exclusive content. Facebook participants can also create a wish list of up to five cards, and feed an alert about the cards on the wish list to friends. Collector cards offer fans new insight into Halo Legends. The collector cards are created from both character models and still images from the film, and are displayed across 40 (??) individual, beautifully-designed virtual cards. The sweepstakes features a Grand Prize for one (1) lucky winner plus one (1) guest to take a 3-day/2-night journey of their own to 343 Industries in Redmond, WA for a private screening and a chance to meet some of the creative team behind Halo Legends. In addition, the Grand Prize winner will receive an Xbox 360 Elite and Halo Legends on 2-Disc DVD or Blu-ray. There will also be three (3) First Prize winners who will receive an Xbox 360 Elite and a Halo Legends on 2-disc DVD or Blu-ray. Ten (10) Second Prize winners will receive a Halo Legends standard edition DVD. The sweepstakes is open to all residents of the United States and Canada (excluding Quebec). NO PURCHASE NECESSARY TO ENTER. Sweepstakes begins at 12:00:01 AM Eastern Standard TIME (“EST”) on January 26, 2010 and ends at 11:59:59 PM EST on March 2, 2010. Open to individuals who are, as of Entry, registered users of Facebook, 18 years of age or older; legal residents of, and physically located within the 50 U.S. (including D.C.) and Canada (except Quebec). This Sweepstakes is not sponsored, endorsed or administered by FACEBOOK, nor is FACEBOOK associated with the Sweepstakes in any way. Any questions, comments or complaints regarding the Sweepstakes must be directed to the Sponsor or Administrator, and not to FACEBOOK. Void in Quebec and where prohibited. Go to: http://HLSweeps.com/Rules.html for official rules.